In evaluations of fall colorant applications and annual and perennial ryegrasses overseeding in bermudagrass athletic turf, seasonal environmental differences affected application benefits and color. Credit: Ben Wherley. Across many regions of the United States, water restrictions have created challenges for professionals who work to maintain playing surfaces on recreational turf facilities such as golf courses and athletic fields. As municipalities impose stricter irrigation restrictions—particularly during winter months—turfgrass professionals are looking to alternatives to overseeding practices, such as the use of colorants, to produce healthy, safe athletic turf. The authors of a study published in the May 2016 issue of HortScience explained that winter overseeding of dormant bermudagrass athletic turf is common in the transition zone and in southwestern and southern regions of the U.S. The practice of overseeding creates an actively growing cool-season turfgrass stand that provides green color during winter dormancy, as well as functional recreational turf. Overseeding requires regular irrigation or precipitation, however, and therefore presents challenges in areas where municipal water restrictions limit winter irrigation. Turfgrass colorants are becoming more widely used as alternatives to winter overseeding, particularly on warm-season golf courses and athletic fields. Studies have shown that colorant application can cost two to three times less than overseeding. 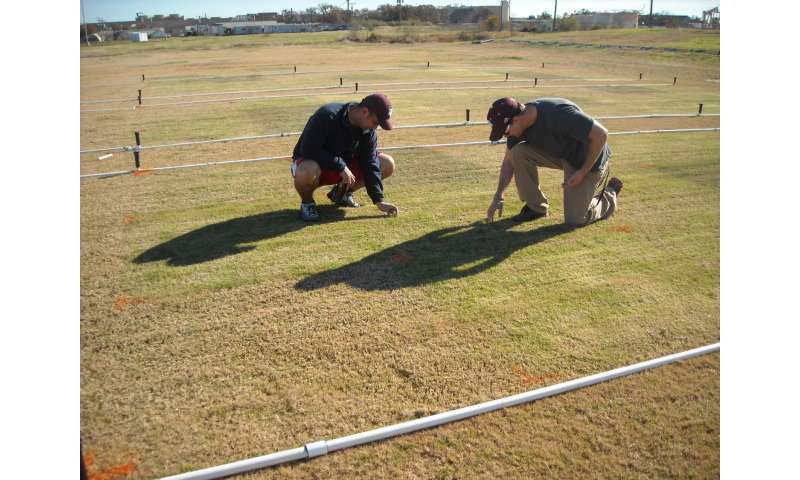 In a 2-year field study at the Texas A&M University Research Turfgrass Field Laboratory, Daniel Hargey, Benjamin Wherley, Casey Reynolds, Richard White, and Garrett Parker evaluated the effects of winter treatments overseeding and colorant application on 'Tifway' bermudagrass under a 1-day per week supplemental irrigation. Experimental treatments included 1) untreated bermudagrass, 2) fall colorant-treated bermudagrass, 3) perennial ryegrass overseeded bermudagrass, and 4) turf-type annual ryegrass overseeded bermudagrass. The researchers compared performance, tolerance to simulated traffic, and spring transition of bermudagrass across treatments for both years. Results showed that both annual ryegrass and perennial ryegrass maintained acceptable levels (60-80%) of green cover during each year of the study. "While tolerance to simulated traffic did not differ between the two species in year one, higher precipitation and cloud cover during year two may have contributed to greater injury levels within annual ryegrass in year two," explained Benjamin Wherley, corresponding author of the report. Analyses also showed that residual benefits of fall colorant application were variable, extending into February of year one, but dissipating by late December of year two. "These results indicate that repeat applications are likely necessary to maintain color during winter months, with the number of applications depending on environmental conditions," Wherley explained. Overseeding (regardless of species) reduced spring transition of bermudagrass by 40-50% compared with untreated and colorant-treated plots. Fall colorant treatments did not accelerate bermudagrass transition compared with untreated plots. "Results of the study demonstrate that environmental differences from season to season can impact the relative benefits derived from colorant applications, as well as the performance of annual and perennial ryegrass," the authors said.